James, an Edina resident who attended the Construct Tomorrow event with the Big Brothers Big Sisters program, solders his first pipe at Pipefitters Local 455’s booth. Maria Meza watched intently as Robbie Luukkonen, a journeyman member of Bricklayers Local 1, installed ceramic tile onto a makeshift practice wall. When Luukkonen had finished the demonstration, Meza picked up the tools and tried tiling for herself. Meza and dozens of other young people received a hands-on introduction to careers in the Building Trades yesterday at Construct Tomorrow, an apprenticeship fair held on the outdoor quad on the grounds of the Humphrey Job Corps in St. Paul. Several unions set up interactive booths around the quad, marketing their apprenticeship programs to young people – from middle-schoolers to 21-year-olds – from several educational and job-training initiatives, including Big Brothers Big Sisters, the Humphrey Job Corps and UnderConstruction, a program that introduces urban teens to the Building Trades. Participants wandered from booth to booth, trying out the tools of various trades and firing questions at journeymen volunteers like Luukonen and apprenticeship instructors like Mark Szybatka of Sheet Metal Workers Local 10. “They ask how people get into the trades, how long it takes to complete the apprenticeship,” Szybatka said. “Some ask us about injuries – cuts – because of the sharp edges we work with. 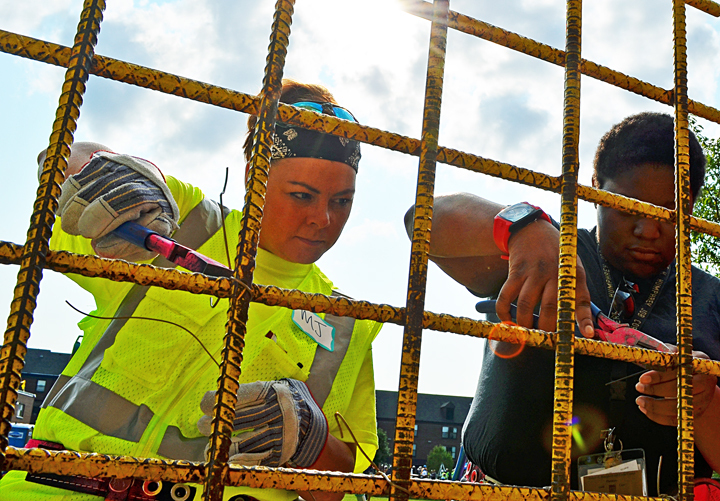 Ravinia Walker (R), a 21-year-old from St. Paul, watched as M.J. Fackler, a second-year apprentice with Ironworkers Local 512, demonstrated different methods of using wire to tie rebar together. Local 10, Szybatka said, will take on about 100 new apprentices this year. They will join more than 358,000 registered apprentices nationwide, according to U.S. Department of Labor statistics from 2012. With college tuition on the rise, apprenticeships appeal to aspiring workers looking to start earning good wages right away. Most apprenticeships mix coursework with paid, on-the-job training, and some Building Trades apprentices are eligible for health insurance and other benefits as a result. Each year, according to the DOL, Building Trades unions and their partner contractors invest more than $1 billion in apprentice and journey-level training, millions more in training facilities and about $10 billion in apprentice wages and benefits. That investment represents a major boost not only to the construction industry, but to the U.S. economy as well. 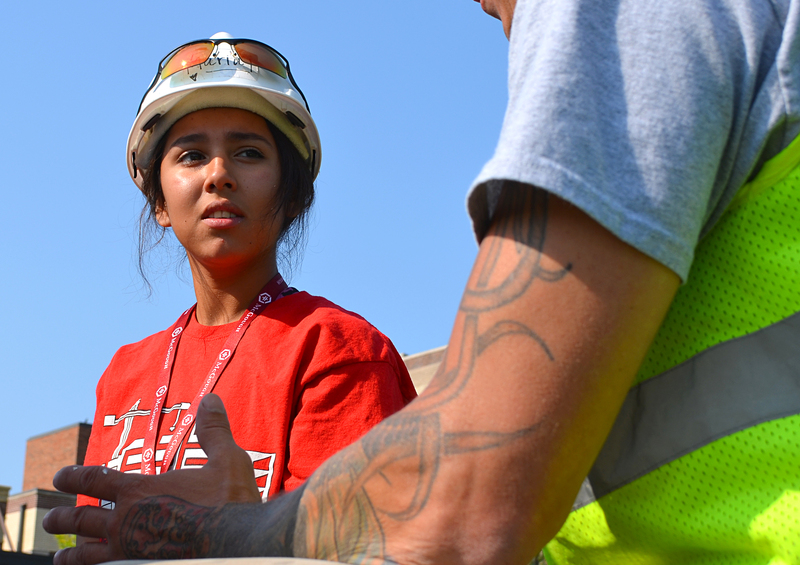 Maria Meza, who graduated from St. Paul Johnson in the spring, will enter the Carpenters union’s apprenticeship program this fall. 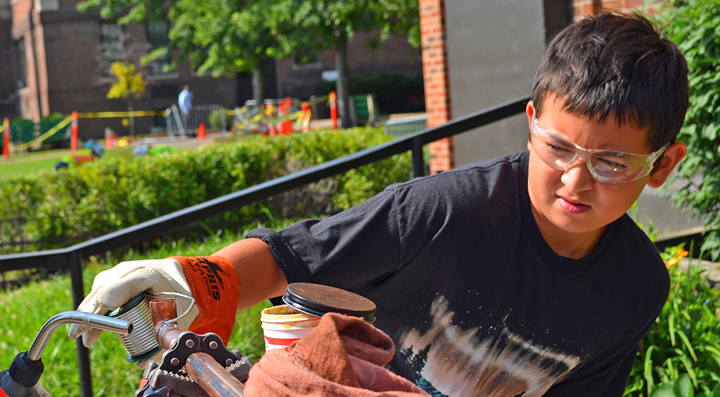 Despite the benefits of apprenticeship, awareness among young people remains low, said Joe Navejas, a business representative for Roofers Local 96. Construct Tomorrow is also an opportunity for apprenticeship programs to reach out to women and young people from minority communities, who often are underrepresented in the Building Trades. 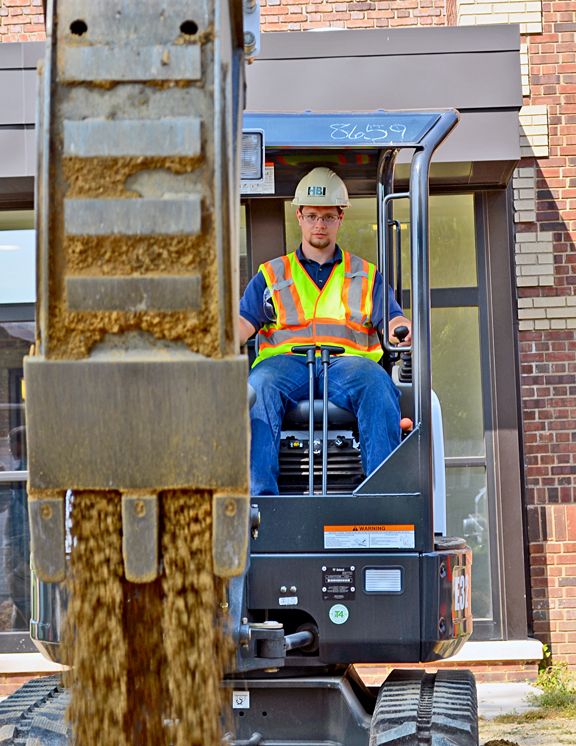 Brett Rickert, 20, of Avon attended as part of his curriculum at the Department of Labor & Industry’s Humphrey Job Corps, a free program that provides students 1,000 hours of pre-apprenticeship training in the basics of construction work. Dawn Zamora, a journeywoman with St. Paul Pipefitters Local 455, worried about how others would react to having a woman in their class when she began her apprenticeship six years ago. What’s more, Zamora found many journeymen were willing to share advice and tricks of the trade with apprentices on the jobsite – a quality Zamora carried forward yesterday, helping Construct Tomorrow participants solder copper pipes at Local 455’s booth. Click here for a directory of apprenticeship programs offered by Minnesota’s Building Trades unions.